An ideal filter for outdoor and nature photography, this 62mm Circular Polarizer Filter from Polaroid helps to reduce reflections and glare by filtering out light that has become polarized due to reflection from a non-metallic surface. This results in a noticeable increase in the saturation of skies and foliage, as well as clearer imagery when photographing in hazy conditions. A circular polarizer differs from a linear polarizer in that it supports full use of a camera's autofocus and auto exposure functions. This filter is constructed from optical glass and features an aluminum filter ring that is durable yet lightweight. Optical glass construction maintains image quality and the aluminum filter ring is both lightweight and durable. 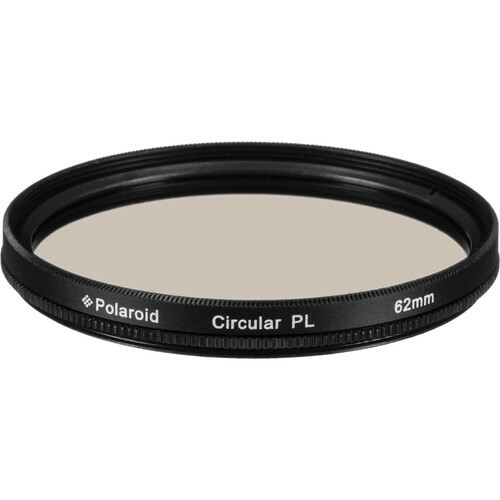 62mm Circular Polarizer Filter is rated 4.5 out of 5 by 2. Rated 4 out of 5 by Buck from It works fine! What can I say other than it works as it should. I know it makes sense to only put good glass in front of good glass. If I had money to burn I'd always buy the very best, but I don't think it actually makes a significant difference. I've made pictures where I had to shoot through ordinary window glass, windshields... if I could get close enough to the glass to eliminate the reflections, glare, flare, and the glass was fairly clean the results were usually fine.